June 24, 2016 – Who, what, when, why, how? Scientists are the ultimate detectives in unraveling the mysteries of the universe. Through observation, experimentation, exploration and research, scientists help us to better understand the world around us and space beyond. 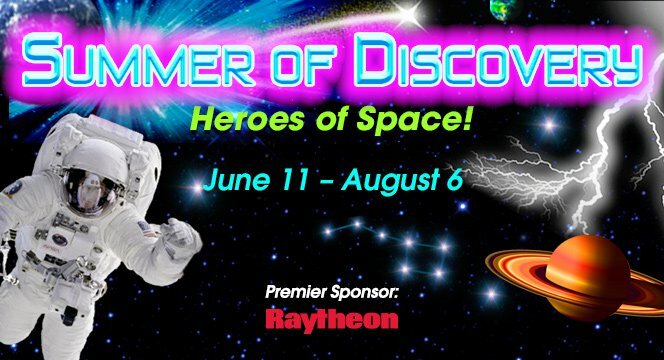 This summer, the Space Foundation Discovery Center is celebrating the Heroes of Space, each with its own two-week theme – Visionaries, Scientists, Engineers and Astronauts. The second theme of the summer, “Scientists,” begins this Saturday, June 25. A New Perspective on Mars, The Red Planet in 3D, an exhibit brought to the Space Foundation by the German Space Agency (DLR), is a unique 3D experience that takes visitors on a path to explore our nearest neighbor, Mars. See it before it leaves on July 1. The featured traveling exhibit for the summer is Super Kids Save the World, presented by Children’s Hospital Colorado and hosted locally by Pikes Peak Children’s Museum. This interactive exhibit is designed for children ages two through 10 years, and helps them learn that by taking simple steps in their daily lives, they can become eco-friendly superheroes in their own communities. Located only five minutes from Garden of the Gods Park, at 4425 Arrowswest Drive, Colorado Springs, the Space Foundation Discovery Center is the region’s only space, science and technology attraction. Hours are Tuesday – Saturday, 10:00 a.m. – 4:00 p.m. PLEASE NOTE: for the July Fourth holiday weekend, the Discovery Center will be closed Saturday, July 2 – Monday, July 4. Military discounts are available. For admission fees and other information, visit www.spacefoundation.org/museum, or call the Space Foundation at 719.576.8000.